There’s a lot of big talk about the China MMA scene... I’m for sure guilty... but mixed martial arts out here, for all of the hype and effort put into it over the past few years, is still a novelty. The circle of fighters and coaches is tiny, maybe a couple hundred, and can’t compare with the thousands of athletes competing in other combat sports all across China. That fact hit me while walking through the Shaolin Tagou Wushu Academy earlier this year. I went to watch Vaughn Anderson teach BJJ to Chinese Sanda fighters, but while checking out the grounds I saw a lot of kids wrestling and boxing. The boxing program at Tagou probably doesn’t get the attention that the Wushu or even MMA programs do, but in terms of international success and impact, Chinese boxers have done a lot more than their martial cousins. Most notably Zou Shimin, a former farmer from Guizhou who won gold medals at the 2008 Beijing and 2012 London Olympics. The boxing tradition in Asia was brought to my attention by an article about Warren J. Clear, the US military man who brought boxing to Japan. The article, “Amateur Boxing in Pre-World War II Japan: The Military Connection” describes the arrival of boxing in Japan just after WWI, and the reaction of Japanese military brass. For Japan, a militaristic nation with imperial ambitions and no qualms concerning adopting foreign martial skills for their own purposes, boxing was just another tool to master and use. Chinese were taking up boxing at this time too, but there are a few differences in how the sport evolved in each country. The major difference between the development of boxing in Japan and China was not the origin - both began in seaport bouts between Western sailors and local martial artists - but in the role the government played as time went on. Militaristic Japan gave way to a democracy, and boxing in Japan generally moved into privately run clubs and circuits. In China, the decrepit, powerless center of the Qing Empire morphed through the chaos of the 1930s and 40s into a totalitarian Communist government. Boxing became the government’s tool, to ban or promote as it saw fit. During the 1950s and 60s, boxing was outlawed in China. After Mao died in 1976 (and even a few years beforehand) martial arts started creeping back out from under the rock it had hid under during the worst of the Cultural Revolution. 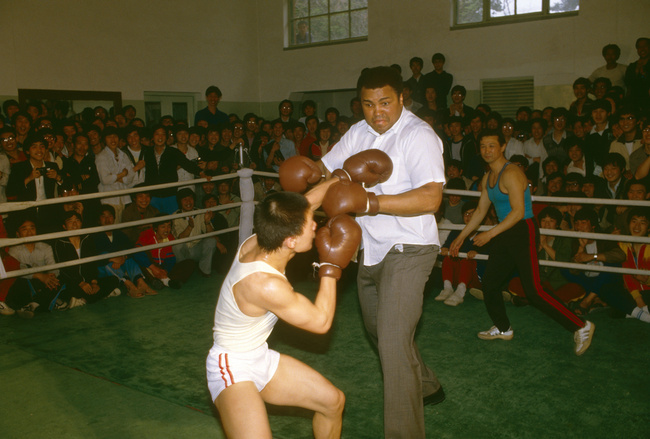 When Muhammad Ali hugged paramount leader Deng Xiaoping - the man who reformed and opened up China - boxing was back. 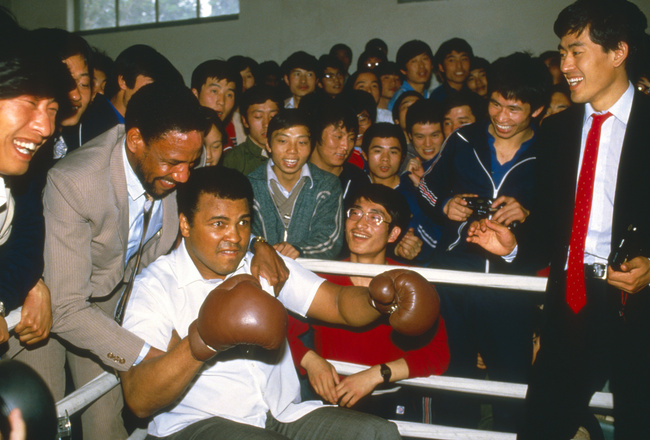 State schools across the country revved up their boxing programs, and less than a decade after his first vist, Ali came back and sparred with the first generation of modern day Chinese boxers. (At least one of those Chinese boxers is still involved in the game, as a referee for Shanghai’s white collar smoker, Brawl on the Bund). It took China another 25 years to produce champion boxers. They reached that apex in 2012, bagging medals during the Olympics in London, and the WBC Minimumweight belt in November. Given the coaches who started the ball rolling in the mid seventies, that means it took three generations to make it to the top. That year also saw the release of Yung Chang’s documentary film, China Heavyweight, which follows a boxing coach and two of his charges around the Sichuanese countryside. The film describes not only the micro struggle of young fighters, but also the many social and bureaucratic hurdles boxers have to jump in order to make something for themselves in this country. 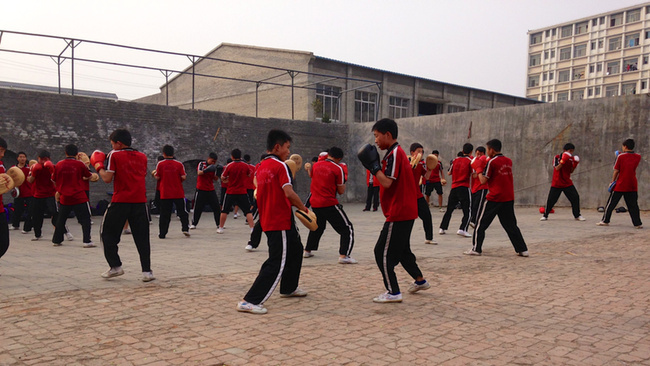 This, the fourth or fifth generation Chinese boxer, is who I saw at the Tagou Academy hitting pads in the courtyard. China’s system favors the very elite, leaving everyone else to founder about looking for some sort of way to survive. In a system in flux like China’s, the private sector is not yet strong enough to pick up the slack of government indifference. One coach told me that 500 kids enter, maybe three leave. The rest go back to the farm.